Born on April 26, 1896, Ernst Udet was truly destined to be a fighter pilot. He was fascinated with aviation from an early age which resulted in him achieving so much during his lifetime. He married at an early age but due to his wandering tendencies, the marriage didn’t last long. While he was not successful with his love life, he was creating a name in the aviation field. He had many awards and was an ace fighter pilot. However, he was not happy as he was blamed for the failures of some battles which resulted in his suicide. Munich Gymnasium. Even at an early age, Udet was already enthralled with aviation which is why he was often found hanging around a nearby airplane factory and an airship detachment. In 1909 he became a member of a model airplane club and a year later he was trying gliding flying. On August 2, 1914, he tried joining the army but was disqualified due to his height. Later in August the Allgemeiner Deutscher Automobil-Club was looking for volunteers who own motorcycles, he applied and was accepted. He was then hired as messenger rider. From then on, he undertook private flight training and later joined the German Army Air Service. Udet was born to loving parents, Engineer Adolf Udel and Paula nee Krueger. He was lavished with gifts by his parents during his early years. At the age of 20 he married Eleanor Lo Zink, his childhood sweetheart, on February 20, 1920. Their marriage didn’t last long because Udet was a womanizer; they were divorced on February 16, 1923. He later on developed other serious affairs with Countess Margot von Einsiedel in 1924, Ingle Bleyle in 1933 and Ehmi Bessel whom bore him a daughter. Dinah Hinz was born in 1934, who was the only known offspring of Udet. Ernst Udet was born on April 26, 1896 in Frankfurt. He grew up to be a happy-go-lucky child in the Bvarian City of Munich. In 1906 he started his primary education in Stielerstraße and then the Theresienwiese. Udet first flew in an observation unit as a Staff Sergeant pilot with Lieutenant Justinius as his observer. They were awarded the Iron Cross due to their bravery in risking their lives to return to the German lines instead of accepting capture by allied forces. He was later on court-martialed for bad judgment on loosing a plane overloaded with fuel and bombs. He remained under arrest for 7 days. Although released he was then moved to fighter command in early 1916. As a fighter pilot, Udet soon made several kills. The most memorable battle which won him the Iron Cross was on March 18, 1916. He was supposed to be attacking 2 French aircraft; instead, he found a formation of 23. He attacked them from above and behind making it his most ambitious attack. Due to his excellent flying skills, he was invited to join the Flying Circus, Jagdgeschwader 1. The group was composed of the elite German fighter aces under the leadership of the infamous "Red Baron", Manfred von Richthofen. 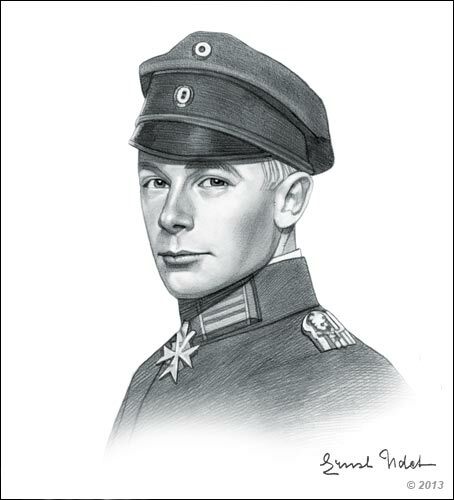 Ernst Udet committed suicide on November 17, 1941 in Berlin. He shot himself in the head while he was on the phone talking with his mistress, Ingle Bleyle. According to the evidence, his miserable association with Erhard Milch and the Nazi Party was one of the reasons of his mental breakdown. His grave can be visited in Invalidenfriedhof in Berlin. Although the Nazis were ashamed of manor of Udet's death, they honored him by laying him to rest with other national heroes and was given a state funeral. He was indeed a hero! His concern with the development the Luftwaffe was enough proof that he was not interested in politics and just wanted the "team" to win all battles regardless of who was being fought. Iron Cross – Both Udet and his observer Lieutenant Justinuis worked together risking their lives to balance their Aviatik B.I so they could return to the German lines rather than be captured by allied forces. House Order of Hohenzollern – The award was given to him due to his excellent leadership as a squadron commander and spending a lot of time coaching new fighter pilots than required. Pour le Mérite – This award was given while he was on leave due to an ear infection in April 1918. Knight’s Cross of the Iron Cross – He was promoted to colonel general after he was awarded in July 19, 1940. 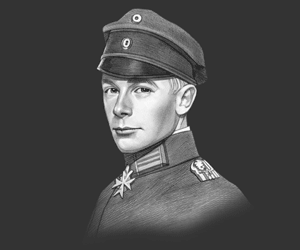 This picture of Ernst Udet is Copyright © June 2014 Siteseen Ltd. We only allow this picture to be used for printed non-commercial purposes and particularly encourage it's use for printed educational non-commercial purposes. This Ernst Udet picture is not in the Public Domain. 3) Use of this Ernst Udet picture, or any of our pictures on websites re-distributing copyright free material is strictly prohibited.